I have noticed that I get a lot of hits from people searching "present simple" and "ESL," and assume that this is language teachers looking for ideas or lesson plans. The following links are good places to start. Here you will find lesson plans organised by level. A fantastically useful site for busy teachers, and easy to navigate. Here lesson plans are organized by topic. There are more teaching activities in the 'downloads' section. They have not updated this page for a while, but there is still a lot you might find useful. This is an online journal, good for ideas, inspiration, and especially good towards the end of semester when you're feeling not quite human. Almost too much to wade through, but a very useful resource. Lots of links to other sources. This is a page specifically dealing with teaching simple present and present progressive. I have not tried any of these, but there are a lot of ideas here, and they look good. At the very least you will be inspired. 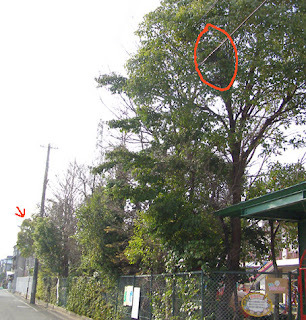 Last night I did a little research (with the aid of Professor Google) and discovered the reason why the two crow nests in the little park are so different. 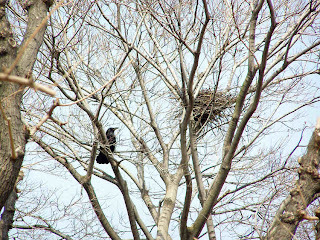 The hippie nest belongs to a carrion crow, and the avant-garde nest to a jungle crow. I didn't even know there were any carrion crows around here, but evidently there are. 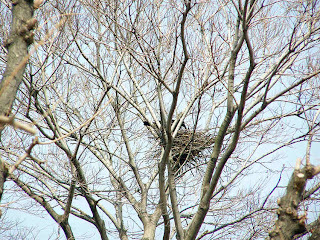 Today I went back to the little park to see if I could get some better pictures of the wire nest, and was just in time to see the carrion crow mother coming back to her hippie nest. When she was standing on a branch, she called to some other crows that were flying overhead, and her head bobbed up and down. That settled it. 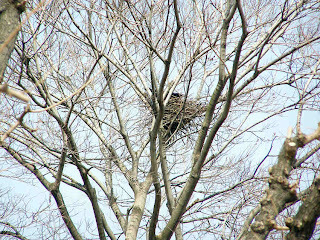 She nests in a deciduous tree, and her head bobs up and down when she caws. She is a carrion crow. 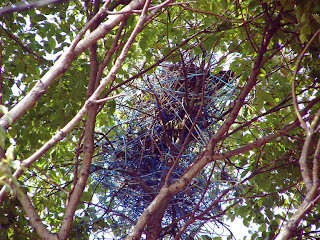 It looks like the nest is abandoned and collapsing, from this angle. 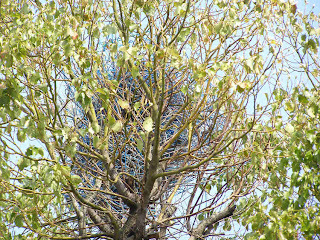 Either that or it is a very tall nest. As I cycled off, about a hundred metres down the road there was a school, and I was still looking up into trees as I cycled. What I saw made me wonder whether I have been cycling around with my eyes closed for most of my years here (or possibly with my eyes on the traffic? 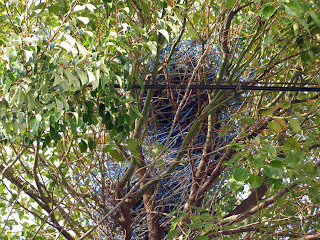 ), because I then saw not one but two more hanger nests. TWO! That means there are three, within about a hundred metres of each other. How bizarre. I took my life in my hands again to take these pictures. I had to stand in the middle of the road, and again got honked at. This is a truly horrible picture, and I normally would not post it, but it shows where the school crow nests are located in relation to each other. The park was behind me when I took this picture. 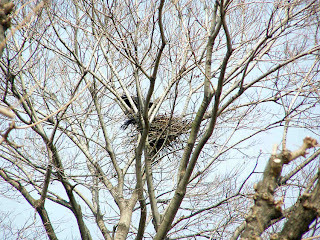 And next is the nest marked with the circle, which, like the one in the park, seems to either have two levels or be in the process of collapsing. 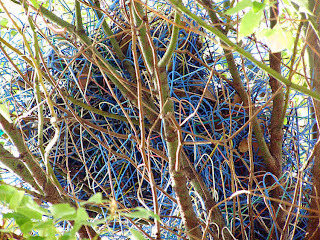 It seems odd that these nests should collapse, though. 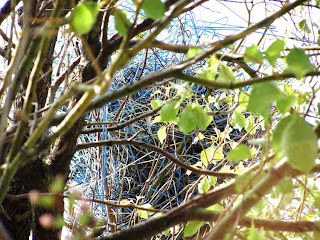 When the hangers are that tangled up, I can't imagine them untangling themselves easily, even in a high wind. Maybe they're not collapsing after all. 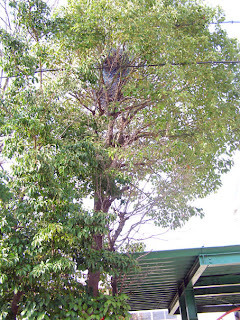 Maybe they are two-storey crow nests. Here is a close-up of that last one, giving an idea of the sheer number and tangled-up-ness of the hangers. Conclusion: the jungle crows around here are suffering from obsessive-compulsive disorder. Incidentally, the other bird I saw yesterday was not a thrush. It was a bulbul. I saw it again today, and when it called out to its friends I recognized its voice. I was misled by its speckled chest. 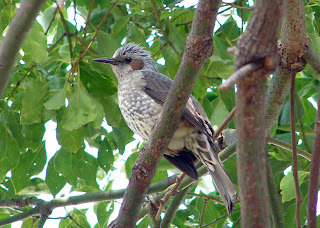 It sat in the tree above my head for a long time, and posed. I think it was showing off a new haircut. I for one appreciate you risking life and limb to capture these pictures. Nevertheless I recommend you stop, and that's not just the liability lawyers in my head talking. Kenju: These photographs provide a clue, I suspect. I'm astounded at the amount of coathangers these birds have collected AND made into a nest. They're definitely OCD. Or just plain mental.